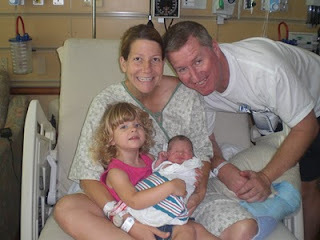 Congratulations to my sister Anna and her husband Tim on the birth of their 2nd daughter, Jamie Nicole Looney. She was born on Thursday May 6 around 5pm (I am not the detail guy here.) Here's a picture of the happy family. It will be fun to be part of their life as they grow up. I have two nieces on Bri's side, and they are a lot of fun as well. We'll see them in early June. In other news, we had a fun weekend in St Pete. In at 730PM on Friday and out at 1150AM on Sunday. Bri did a great job giving her speech for the Hall of Fame for Northside Christian. We both did well in the Hurricane Man 2.4 mile open water swim. And congrats to sis-in-law Shana for officially receiving her doctorate in Doctorology! congrats, congrats, congrats, and congrats! !